Hey, that tastes good! : Gnocchi!!!!! 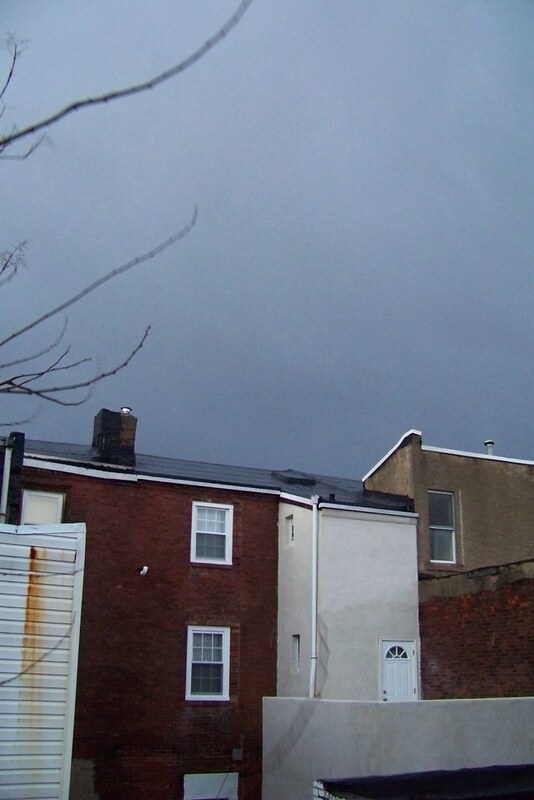 Yesterday was a storm that seemed like the end of the world. I took a nap yesterday after work and ten minutes later I was woken up because the sky was falling. It was 50 degrees and sleeting like I'd never seen, then it stopped, the sun came out, and then a few hours later the sky turned black. And got cold. It was weird. Anyway, I made a special meal for Alex last night, I cooked mussels for the first time (Ma, they came out great!!) and made gnocchi on the side. I've made them before since going gluten free, once, and liked them a lot, but I saw a new recipe I wanted to try on the glutenfreeda site. It turned out to not work for me, maybe because I wasn't using a bread-mix flour. 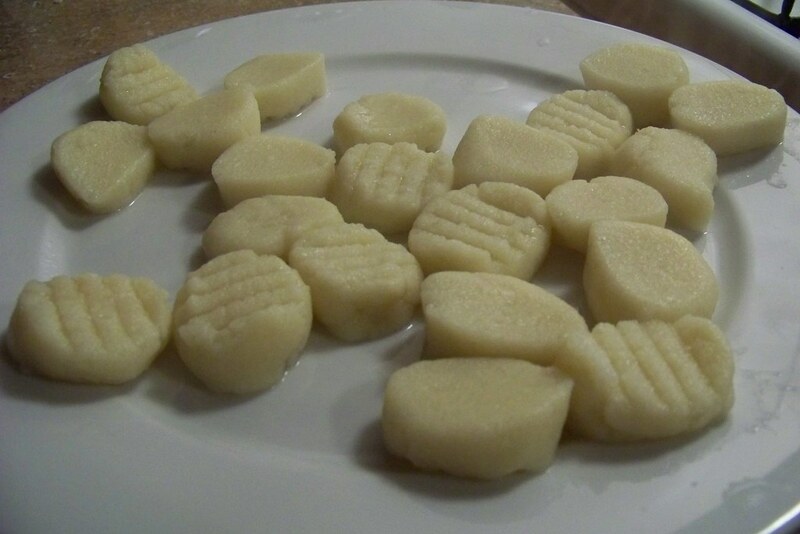 Oh well, I experimented and came out with perfect, fluffy, gnocchi anyway. Take that! Scrub potatoes clean, then poke holes in them and bake at 400 for about an hour, until they're cooked through. Split in half and let cool for a while, then add salt and mash them or put them through a ricer (I don't have one, I mashed mine, but all the recipes I've seen say rice them!!!!). Let cool fully. Mix in egg, then add 1 c flour mix and xanthan gum, then keep adding a few tablespoons at a time until the dough holds together. Dust a cutting board with flour (I used sweet rice) and knead the dough for a few minutes. Break off manageable hunks (about fist sized) and roll into snakes about 3/4 inch thick. If your dough won't roll well, try squeezing it through your hands to thin it out, then rolling to smooth the finger-squeezing marks. 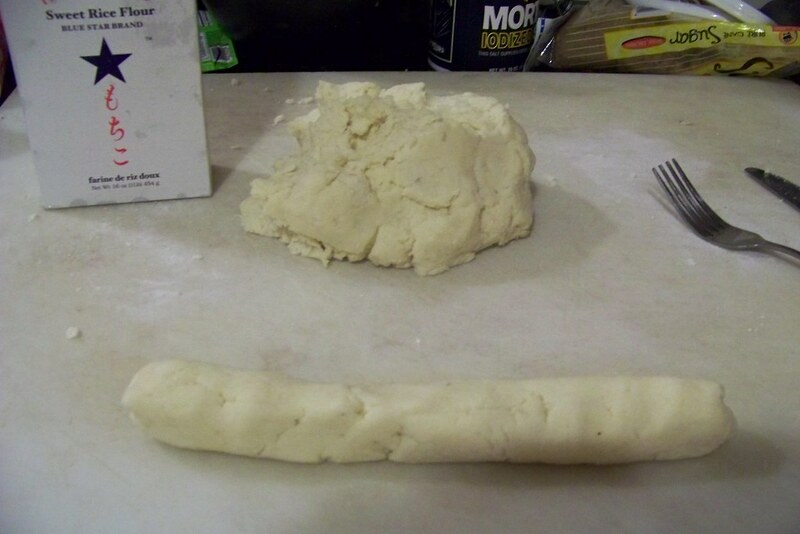 Once you have a decent shaped snake of dough, cut into pieces, depending on how thick your snake is. You want each piece to be a little smaller than a quarter, and oval/square. After cutting each piece, imprint it with the back of a fork, and place on a cookie sheet. If you're eating them all at once, set them aside until you have a big pot of water boiling, and cook in batches about 3-5 minutes each, until they float up to the top. Test if they're done by cutting one in half and either eating it or looking at it. You'll be able to tell if it's not cooked all the way. If you're not eating them all at once (this recipe makes probably 8-10 servings?) 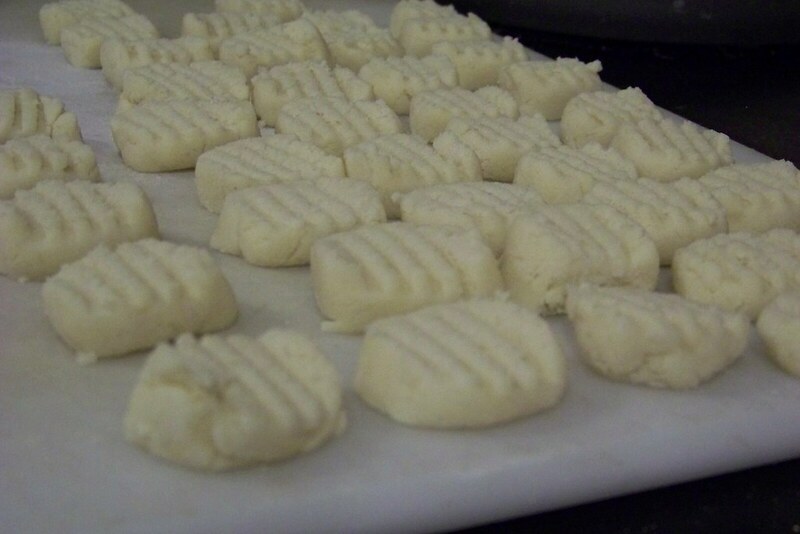 then stick the cookie sheet in the freezer for an hour or two, until the gnocchis are frozen, then put into ziplock bags. To cook frozen-drop into boiling water and cook a few minutes longer than you normally would. Serve with plenty of your favorite sauce, or butter and cheese. And maybe some garlic. Mmm. 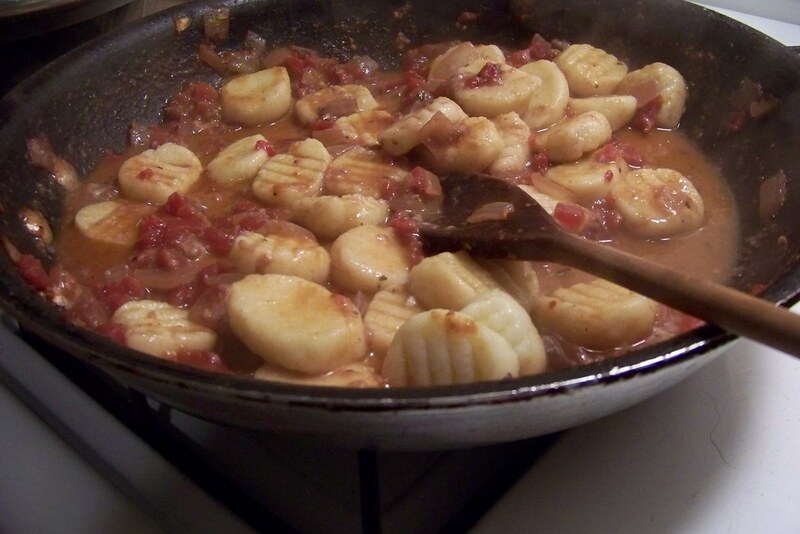 Don't you just love gnocchi?! I found out just how easy they were to make a few weeks ago and have made them several times since. I've got pictures on my site if you want to take a look. Your chicken kiev from a couple days back looks fabulous too!